On Friday, February 7th, at 404 NYC, Novis designer and 2014 Ecco Domani Fashion Fund Award Winner Jordana Warmflash presented her Autumn/Winter 2014 collection. The Novis Autumn/Winter 2014 collection took inspiration from Bauhaus artist Paul Klee, using a palette of warm Earth tones, watercolor landscape prints, and plaids in rich textures, such as velvet devore and cashmere. Key details included rubber tweed appliqués and hand embroidered/beaded accents on evening pieces. Looks were accessorized with fine jewelry by Yael Sonia. The presentation shoes were a collaboration between Novis and Gio Diev. 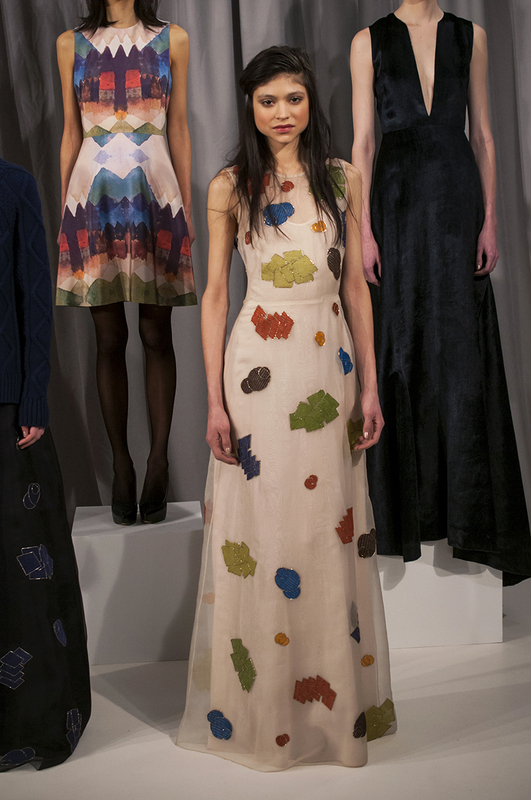 Each pair was handmade in Italy utilizing prints from the Novis Autumn/Winter 2014. This collection further played on Warmflash’s signature aesthetic of uptown elegance meets downtown eclecticism. Novis Autumn/Winter 2014 combines impeccable tailoring in feminine cuts with original prints in luxurious fabrics for a collection that is both modern and timeless.